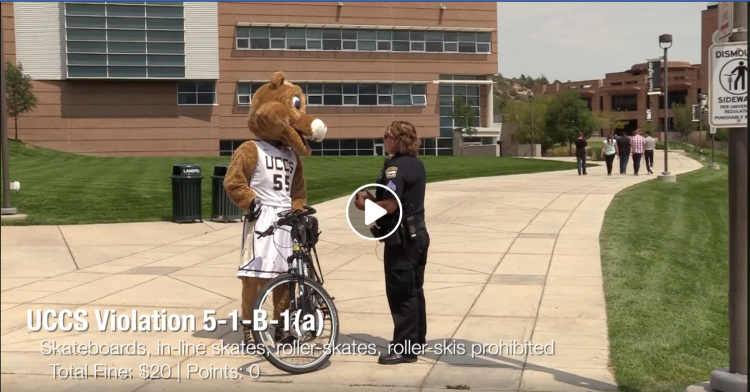 Cyclists and skateboarders are urged to use dismount zones to keep pedestrians safe on campus walkways during a recent video posted on UCCS Police Facebook page. The dismount zones were introduced last September to improve campus safety after many had been hit or had close calls by skateboarders or cyclists. Alternative routes are available to those who want to make it across campus in a timely manner. Dismount zones are the high traffic areas on campus and are shown in orange on the map below. Violators will receive a UCCS fine of $20 to be paid at the UCCS Parking & Transportation Services Office. The video is the third in a series of public service videos by UCCS Police featuring Lisa Dipzinski, sergeant, UCCS Police and Clyde the Mountain Lion Mascot. MOVING REGULATIONS 4. RIDING PROHIBITED Bicyclists will use roadways, bicycle lanes and paths and other maintained ways, unless otherwise posted, and will not infringe upon landscaped areas or any other areas that are under cultivation. This includes benches, stairs, or other architectural components. Bicyclists will not ride on those sidewalks that are adjacent to streets, unless posted otherwise. Other sidewalks may be used providing that bicyclists yield right-of-way to pedestrians. Bicyclists will dismount on any sidewalk where riding is impractical due to heavy pedestrian use or other conflict. Funny and clear way of explaining the rules. Like it! This map needs the appropriate legend so that the image can be standalone. The dismount zones need to be better advertised and indicated on ALL campus maps. Unless this is properly disseminated and easy to find/access then it should not be enforced.